Looking for a beautiful mountain view plus river access? Five Ridge Bluff has it all. Located in Cherrylog, Georgia, on 120 acres of private and SECLUDED land, between the picturesque mountain towns of Ellijay and Blue Ridge, Five Ridge Bluff boasts a splendid MOUNTAIN VIEW, abundant wildlife and native rhododendron, as well as over a mile of HIKING TRAILS along the Ellijay River. This site is named Five Ridge Bluff for the five ridges visible from the covered porch, the farthest being the Tennessee Valley Divide, commonly referred to as the 'Blue Ridge'. Truly a splendid view. This 1300 square foot, non-Smoking cabin has three bedrooms and two baths, with each bedroom uniquely decorated. The Georgia Coast, or master bedroom, houses a king-size bed, sitting area, and jacuzzi in the ensuite master bath and walk in closet. The Southwest bedroom contains a queen-size bed, and the Georgia Country bedroom has two twin beds. The wrap-around deck has a six-person hot tub and barbecue grill. An outside fire pit for camp fires is also provided, as well as a hiking trail which takes you through the woods, along the river, and wraps back around to the cabin. An outdoor target shooting range is also available on the private property. All conveniences of a family home are provided for your comfort ... and we pride ourselves on CLEANLINESS! Fishermen can enjoy over 3/4 of a mile of available fishing along a native mountain stream, all on private land. Hike along the river and explore the native flora, have a picnic in the gazebo by the river, let the kids splash in the water at the island in the river, enjoy the private outdoor shooting range, or just relax on the covered porch and watch the sun set as the geese fly by on their way to Goose Island. It is not uncommon to see deer feeding close to the cabin during the early morning or twilight hours. Convenient access to activities, including only twenty minutes to the beautiful White Path golf range, or less than 60 minutes to Whitewater Rafting on the Ocoee River, site of the 1996 Olympics. Horseback riding, antique shopping, and fine restaurants are close by. Only a little over an hour from Atlanta or Chattanooga. For back to nature seclusion combined with convenient access to a wide variety of activities, come to Five Ridge Bluff! Note: Please see the 'rates' section for full disclosure of rates and payment schedule, as outlined by the owner. Do not trust information from VRBO, which may be inaccurate. We have lived in this beautiful part of North Georgia for 40 years, and felt a desire to share our 'piece of paradise' with others. So, in 2003, we built a rental cabin on our 120 acres. This allows others to share the pleasure of our natural environment in a secluded forest, away from the busy world, yet conveniently located to go to all those outside activites. There are no other rental cabins on our property. Your own private resort! Beginning in 1972, we started building our home in the mountains to retreat from the frantic city life in Atlanta. We moved into our mountain home in 1977, and have never looked back! At Five Ridge Bluff, you have the advantage of having a gorgeous mountain view plus access to the Ellijay River. A mile long nature trail goes from the cabin to the river and runs along its banks -- all on private property. Along the trail you will find spots to fish, play in the river, picnic, or sunbathe. Since it is all on private property, you have it all to yourself! View of the five ridges leading to the Tennesse Valley Divide. Washer in unit. Basic soaps and detergents supplied. Full service of dishes and flatware for eight, including wine glasses. Also mixing/serving bowls and platters, casserole dishes, tupperware, and all basic cooking utensils. All modern appliances including coffee maker, toaster, microwave, blender and hand mixer. Covered outside deck with magestic mountain view. 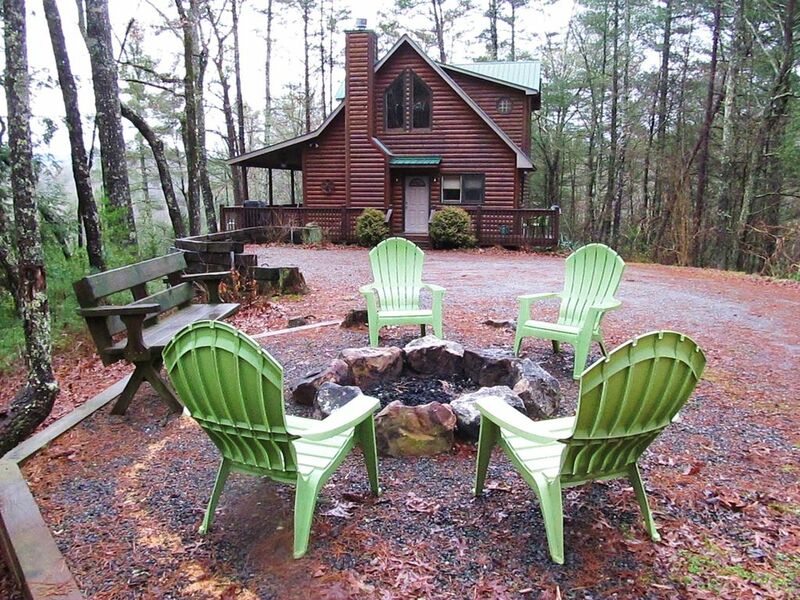 Stand-by generator ready in case of power outage; central heat and air conditioning, as well as gas-log fireplace; a mile of hiking trail along the Ellijay River has spots for picnics, fishing, water play, or just relaxing by the river. Another area of the property has a private outdoor target shooting range. Firewood for the outdoor firepit provided when available. Had a very relaxing time away from the everyday hustle. Beautiful property. Loved the cabin and the views. We definitely look forward to coming back. This place is perfect! I recommend this to anyone who wants to get away, and feel on top of the world. Great views, excellent amenities, and wonderful owners. Thanks again. We will be visiting again! Buster was the best host! He hung out on the porch with us a few times. So well behaved and polite. This property was a peaceful paradise. Our stay was over New Years and we were able to enjoy a fire in the fireplace and enjoy the large porch overlooking the mountains. You can hear the river running and it was so peaceful. The nature trial was amazing and we enjoyed touring the property with Buster. He was our little sidekick for the stay. We made a fire in the fire pit and enjoyed sitting outside enjoying the peacefulness of nature. The cabin was very comfortable and the kitchen well stocked. I would highly recommend Five Ridge Bluff. A very well kept cabin with all the comfort you find at home plus much more. Amazing Mountain View while enjoying a hot jacuzzi, bbq, fire pit to roast some s’mores and have a fun time while gathering with your loved ones. A beautiful river that you can follow to “the Island” where you can hang around and have picnic and dip your feet in the water. I personally enjoyed the shooting range and its peaceful surroundings. Mike, the owner and carekeeper is a very cool guy that will make you feel welcomed. One of the best trips I've had!! Couldn't have been more perfect!! First time my husband and I have truly been relaxed!! The views were perfectly stunning!! We are already planning our next trip!! Mike and Sharon are so great to rent from!! Great place to come and blow off some steam (gun range is a major plus). Nice hiking trails, great island to lounge and swim. Would definitely like to rent this place again. The nightly rental rate is $165 year round. One night is free with a 7 night stay. Taxes and cleaning fee are additional and not included in the first payment. The first payment to VRBO is 50% of the rental amount plus VRBO's service fee of approximately 12%. Final payment of the other 50% of the rental fee plus 12% state and lodging tax, and an $85 cleaning fee is due upon check-in. This second payment is paid to the owner upon arrival, NOT ON-LINE TO VRBO. A $300 refundable damage deposit is due at check-in also, and is returned after departure if there is no damage. Payments made by check, money order, or cash. No credit cards. If cancellation is made 30 days before arrival, guests receive a full refund less a $25 cancellation fee. There is no refund if cancellation is made less than 30 before arrival, unless the cancelled dates become rented by another guest.